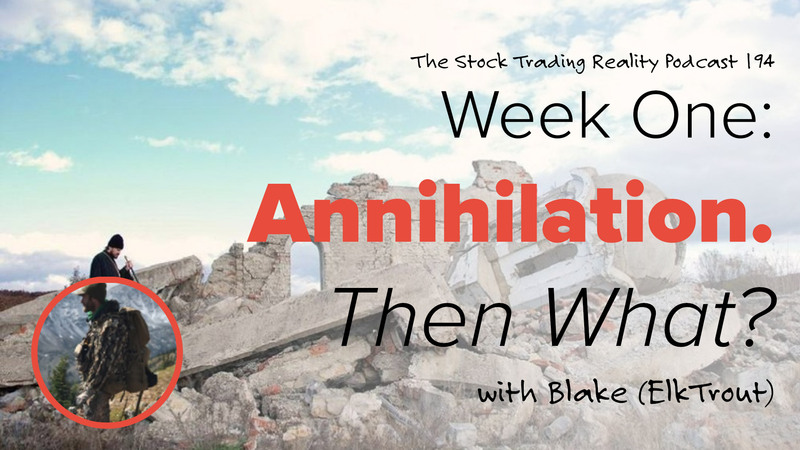 STR 194: Week One: Annihilation. Then What? We’re back with another classic tale of getting punched in the teeth as a rookie. Thanks to our guest, Blake (those of you in the chat room community will known him as ‘ElkTrout’), and his openness, we are given an insight into the dangers of approaching the market in… unwise….ways. I’ve met Blake in person on a few occasions and he’s a class act who knows what it takes to work hard and fight back. Sure, he self admittedly didn’t get started in the smartest of ways, but he also didn’t play the victim card. What did he do? How did he bounce back? That and much more in our nugget-filled discussion with Blake. Let’s get to it! Today we talk to community member Blake who goes by ElkTrout in the community. His work was mainly seasonal at the time so he decided to look for some ways to supplement his income in the off season. This led him to investigate trading, mainly penny stocks. After doing initial research on trading via Google, Blake stumbled upon a few teachers but was able to discern who was genuine and who was trying to sell the ‘get rich quick’ lifestyle. His short stint trading penny stocks lasted 3 weeks before he decided this wasn’t a long term strategy. Blake decided to mainly focus on options trading. Initially he did not do very well since he wasn’t fully understanding of the greeks involved in how they are priced. He also skipped paper trading because without any money on the line he did not treat it realistically. Blake also knew that various paper trading platforms gave unrealistic fills. Something that he struggles with is his actual lack of emotion regarding his losses. Losses impact him so little that he pays very little attention to it which can lead to ruin if not checked. Blake recognizes this and checks on his performance weekly. I found myself dreaming of being rich from buying a penny stock or two and watching it go to the moon. If you’re dumb enough to buy into that you deserve to lose your money, kind of like trading. The first week I got annihilated. I guess that was part of taking my lumps and learning along the way. My chart vision is pretty dialed. I can be confident in that and make trade plans based on them. When you follow through on your ambition it will create consistency.